Michael Glenn Sinclair (born January 31, 1968 in Galveston, Texas) is a former American football defensive end and defensive line coach. He played eleven seasons in the National Football League with the Seattle Seahawks and the Philadelphia Eagles. 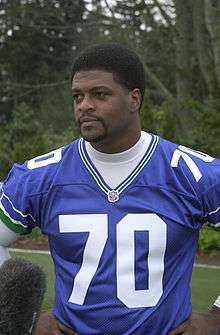 Sinclair was a three-time Pro Bowler in 1996, 1997 and 1998. He led the NFL in sacks in 1998 with 16.5. He won the World Bowl as defensive line coach for the Hamburg Sea Devils in NFL Europa in 2007. He was named the defensive line coach for the Montreal Alouettes in January 2008, where he spent five seasons and won two Grey Cup championships. On January 18, 2013, Sinclair followed Alouettes head coach Marc Trestman to the Chicago Bears. Sinclair was fired on January 25, 2014. ↑ Associated Press (2013-01-18). "Bears hire Tucker as defensive coordinator". Yahoo! Sports. Retrieved 2013-01-18. ↑ Mayer, Larry (2014-01-25). "Bears add defensive assistant". Chicago Bears. Retrieved 2014-01-25.